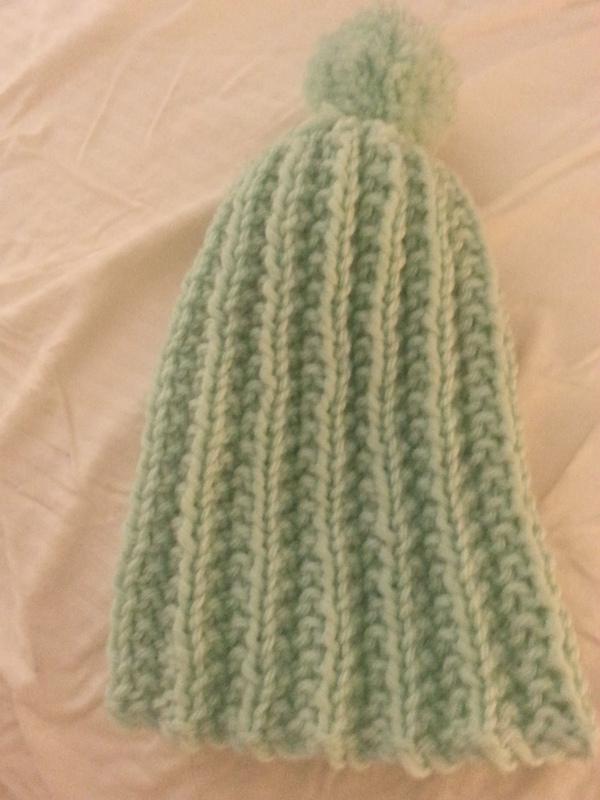 Fresh Off the Needles and Hook! I couldn’t be happier with how it looks! 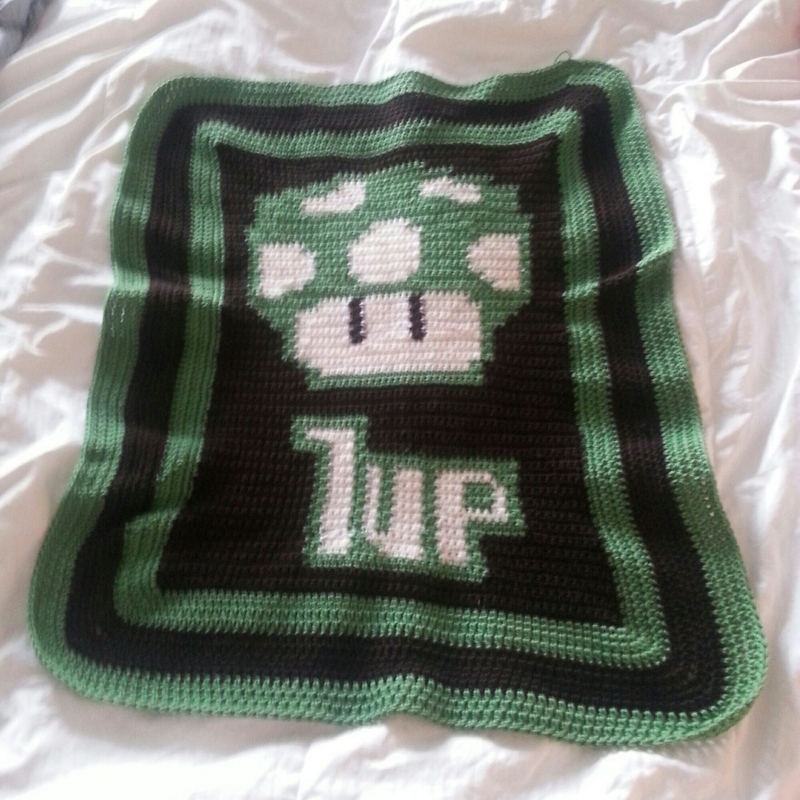 I had to do some modifications to the chart, because it appeared to be off-centered so I shifted it a little so there are 8 stitches on both side of the widest part of the mushroom. Then I sat back to admire my work and noticed that the eyes were also off-center. 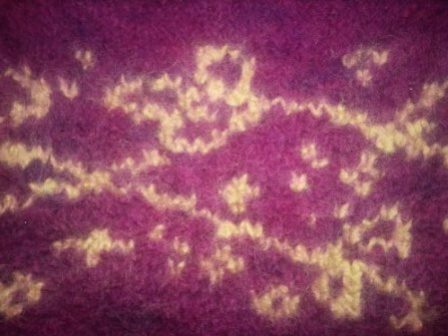 I thought I had miscounted, but when I looked back at the chart I saw that it was indeed uneven, with ten stitches on one side and eight on the other. So I fixed that too. In the end, it was a little annoying to keep balancing things out but well worth it! Another project that I have completed this month is one that has been hibernating in my craft closet since 2010! 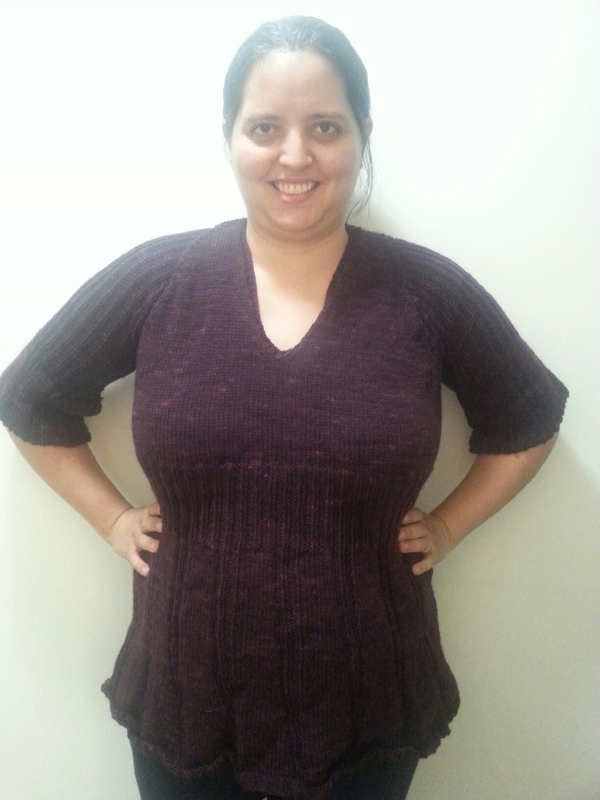 It is a beautiful tunic in which I had the body, one sleeve, and most of the second sleeve already done. I think I got stuck with the second sleeve when the directions told me to “reverse knit” the decreases. I didn’t know what that meant at the time and so I hid it; out of sight out of mind! I am so relieved, not only that I finished it, but that it fits me pretty well too. 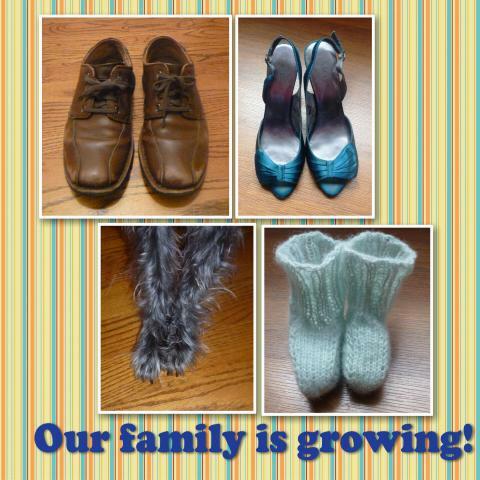 Let’s face it, a person’s body can change a LOT in 1,460+ days, especially after a pregnancy. Both of these pictures are before blocking, once that’s done it can only get better. Currently I am still working on the blue sweater, I have one sleeve done, I just need to keep adding length to the stockinette body and start the second sleeve so that this project doesn’t end up hibernating for four years too. 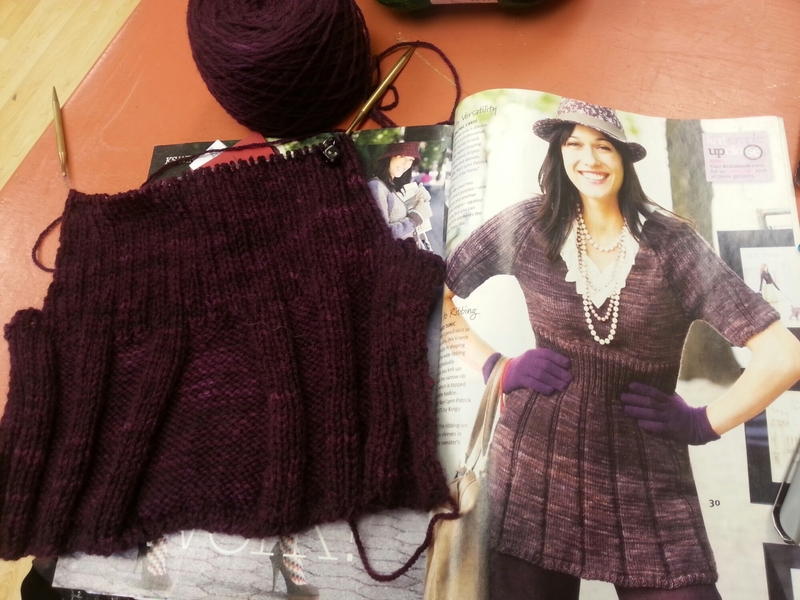 besides that, I have some colorwork projects going on and I plan to cast on a baby sweater to steek. Yep, that’s happening. No more just talking and dreading it, I’m gonna put my yarn where my mouth is! Wish me luck! Hibernating Flower Shawelette Finally Blooms! 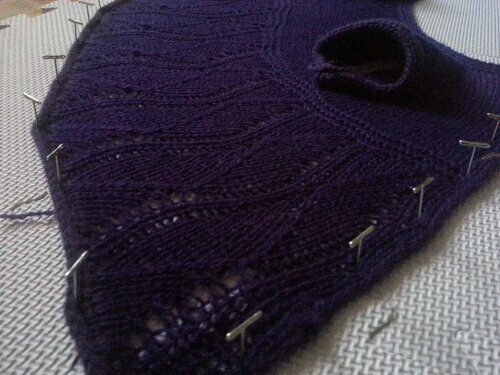 I have not done many lace projects, and in December 2011 I was overwhelmed with three different WIPs on my needles! 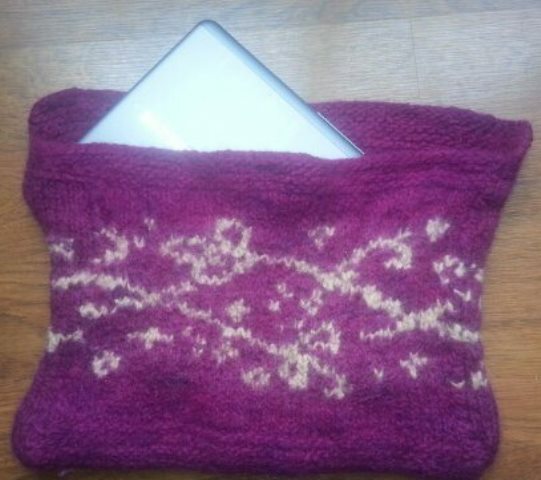 Something had to give and so I put aside the Petal Shawelette Designed by Bonnie Evans (Book: Sock Yarn One-Skein Wonders) to hibernate into my craft closet “for the winter”… HA! 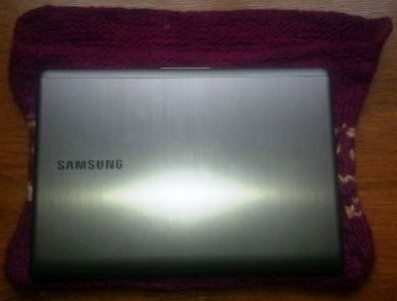 Years later and that shawl made a cross country move before it ever saw the light of day again. Earlier this year my lovely new LYS offered a WIP Help class and I decided it was now or never for this shawlette. I didn’t know where I got stuck or why my stitch count wasn’t adding up, so I went for a little help. 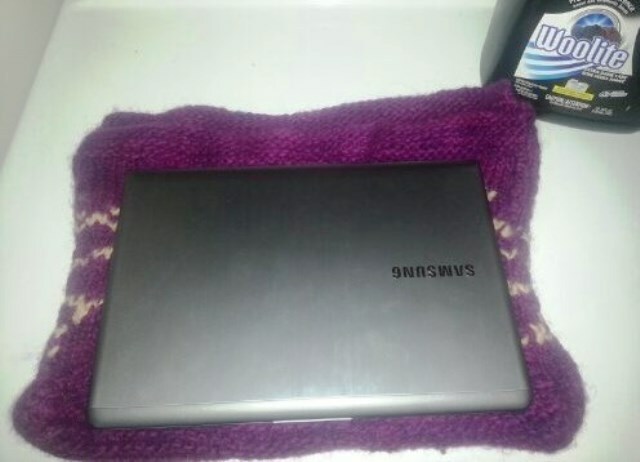 All it took to keep this shawl moving forward was a closer reading of the instructions. Turns out all I was doing wrong was not following the pattern. I thought that after Chart B I had to move onto Chart C, when in fact I needed to repeat Chart B! 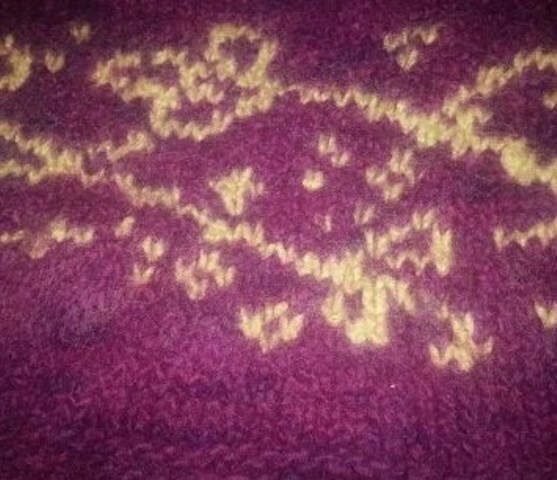 Once that was made clear by one of the knowledgeable and thorough staff of my LYS, I zoomed through the pattern happy as can be that it was finally starting to look like the photo in the book. Of course I was also working on a few different projects and with a new baby, this shawl took a few more months to be completed. But complete it, I did!! I finished the leaf edging over the past week while sick in bed with a horrendous sinus cold. Now it is blocked and I just have to debut it! Over the weekend I had a one woman block party – WOOT! 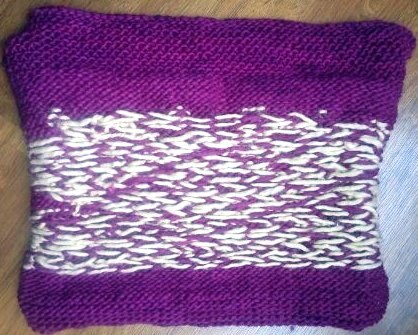 Not only did I work on my report on blocking for the Master Knitter Program, but I also blocked two finished projects. For those that don’t know, blocking is the finishing touch on a completed garment Once you’ve casted-off your last stitch you’re not fully done with it. 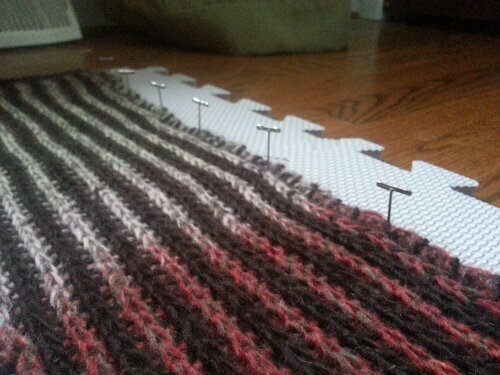 You need to weave in your ends and then block out your pieces so that they have a finished look. 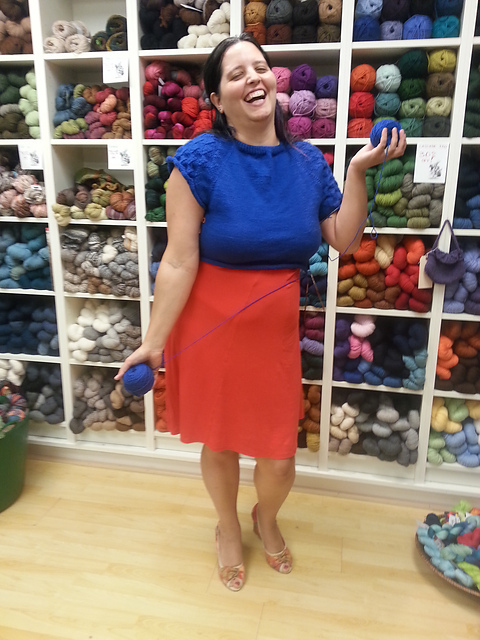 I don’t think I’m explaining this correctly to those that don’t knit and read my blog, let me demonstrate instead. 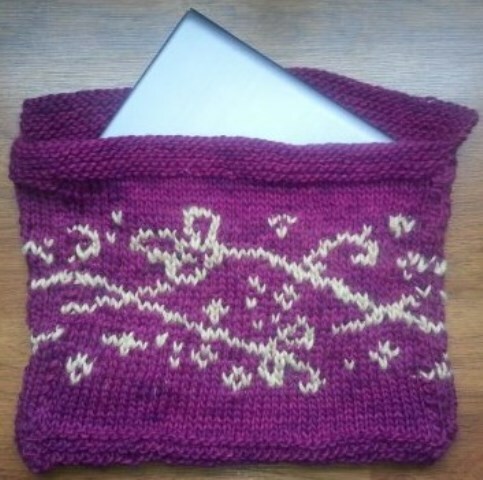 The first item I blocked was a scarf that I made for myself (Pattern: Inside-Outside Scarf, Designer: Elise Duvekot). When I casted-off this scarf the garter stitch edge curled under the main body of the scarf, blocking it solved this problem. Blocking it consisted of me washing it, laying it out on my blocking mats, pinning it down and the letting it sit over night to dry. 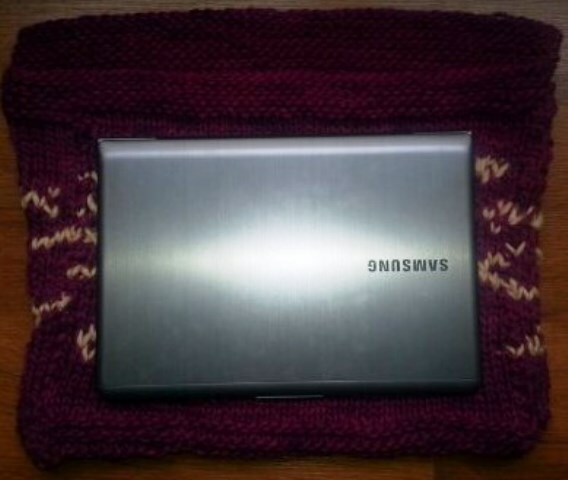 That allowed for the garter stitch edge to lay flat and the scarf grew in length and width. 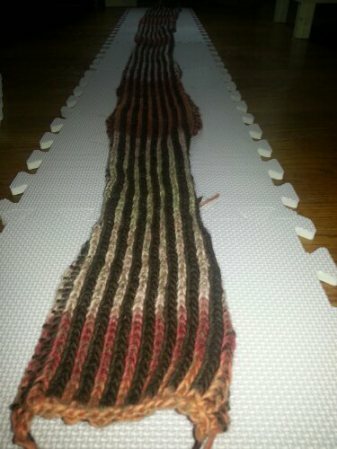 Here is what the scarf looked like before blocking. Notice how the edges are curled up. Here is how it looked once pinned out. Pinning it allowed me to make sure that it had the same consistent width and it grew in length from 7 feet to 9 feet!! The second project I blocked was a baby cardigan that I made as a gift for one of my husband’s fraternity brother (Pattern: Jubilee Cardigan, Designer: Cecily Glowik MacDonald). This little cardigan was knit up in a week but unfortunately I won’t be able to gift it (I will have to tell you all of the troubles I had making it in another post). 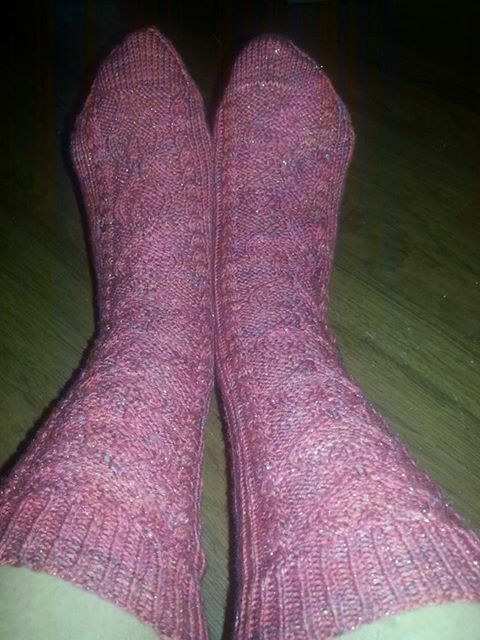 But the important reason why this project needed to be blocked was because of the lace bottom half. When you knit lace garments 9 times out of 10 the design is lost if not blocked. Blocking lace projects allows for the design to bloom, without doing so the eyelets wouldn’t open up to show off all of your hard work. It was great to feel like I accomplished something over the weekend. I hope you have your own block party soon!